The former summer residence of Abraham Abraham of Abraham & Strauss Department Stores. This Cherry Island estate is named Ingleside. The smallest international bridge in North America. The home site on a Canadian island and has a stepping bridge connecting to a tiny American island. Alexandria Bay is a beautiful, quaint town on the United States and Canadian border. Located in upstate New York, the St. Lawrence River community boasts some of the most spectacular scenery in the region. With breathtakingly clear, blue waters, it is no wonder the area is known worldwide for its fishing and water spots. 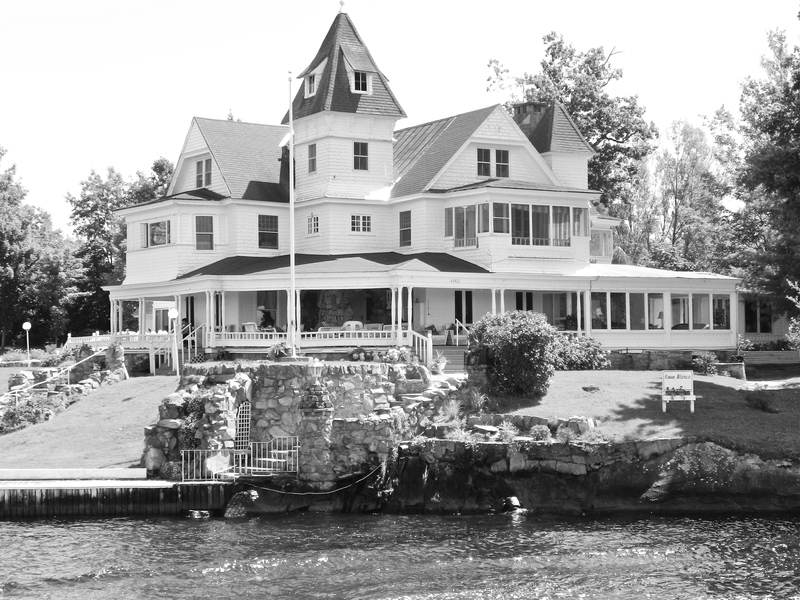 Located on Cherry Island, Casa Blanca was built by the Marx family in 1895. 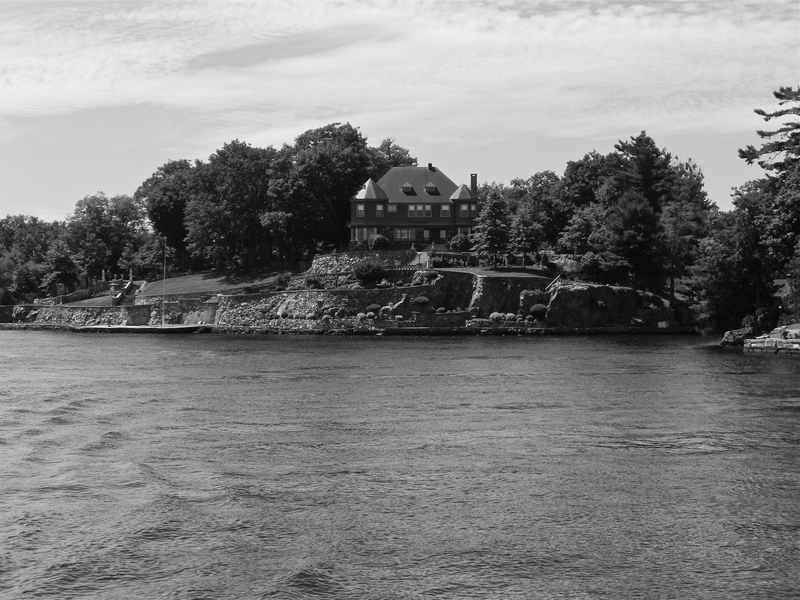 Boldt Castle on Heart Island, New York. 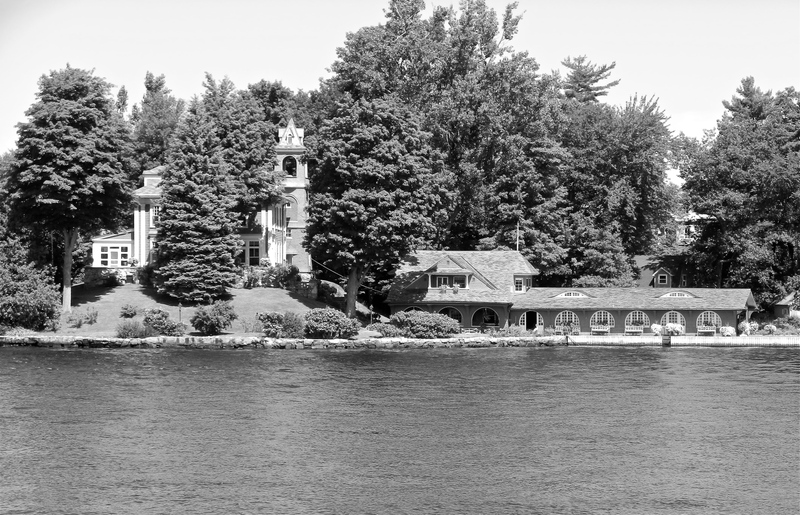 George Boldt to be his and his wife Louise’s summer home. When she unexpectedly died in 1904, the home was left unfinished for over 70 years. 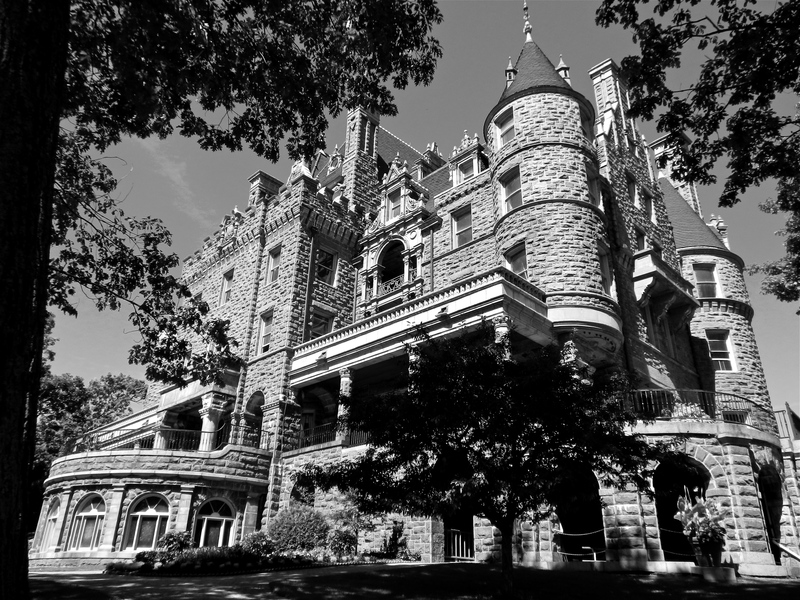 Singer Castle, the hunting mansion of Commodore Frederick Bourne, who owned the Singer Sewing Machine Company, is a large, upscale castle sitting on Dark Island. It is the only castle in the region to ever be finished and lived in. Singer Castle will appear on The Gilded Butler in upcoming months. -Abraham Abraham & Nathan Straus- Macy’s Department Stores. -Dr. JG Holland- Editor of Scribner’s magazine. -George Pullman- Pullman sleeping car frame. Imagine a world where you are unable to drink a cocktail with dinner, or enjoy a beer at a football game. Prohibition was a bully that the bay community would not let take over. During the 1920s, boats carrying large amounts of liquor made their way down the St. Lawrence River to illegally smuggle bottles of the forbidden flavors into the United States. When approached by law enforcement, the alcohol was dumped into the water below to avoid prosecution. To this day, bottles still surface after divers explore the rocky bottom. 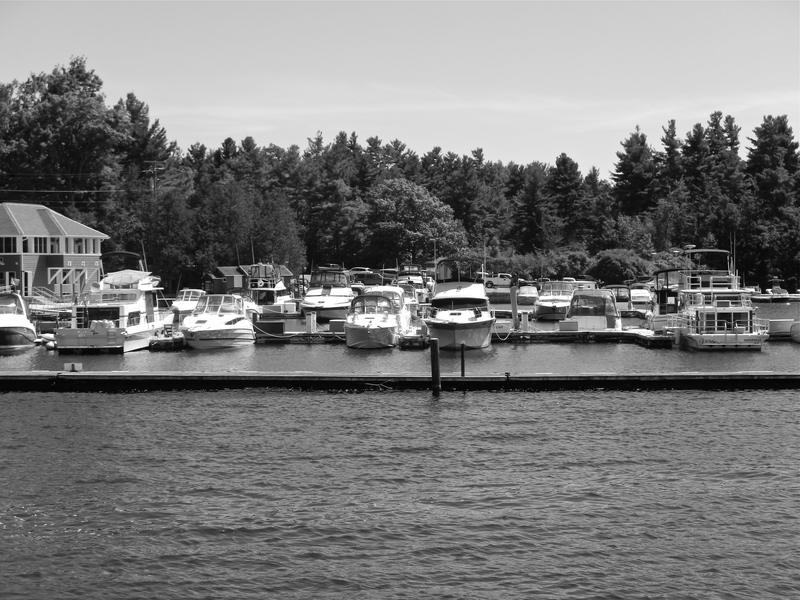 Alexandria Bay and neighboring communities have a great boating history. Still to this day, the waters are filled with small and large boats, ritzy yachts, and large commercial ships. 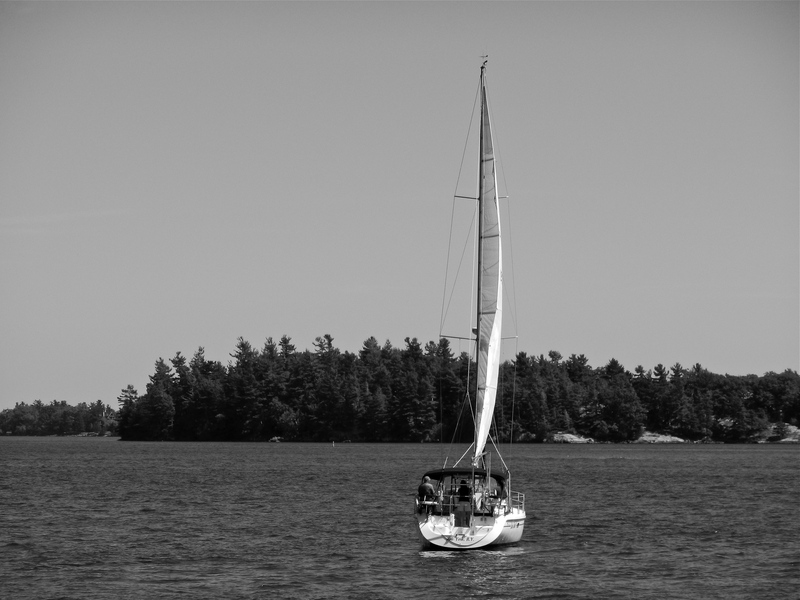 In the early 1900s, small ships like the Captain Visger carried tourists out to sightsee among the Thousand Islands. As time progressed past 1904, those tourists were among the originals to see Boldt Castle’s downfall from an American marvel to a palace in despair. Just like a bustling city street, the St. Lawrence was a highway for commuters and commercial vehicles. Fancy water limousines carried wealthy residents to and from the islands when their yachts were unavailable. There were no worries if a sudden fire broke out on one of the islands- there were fireboats with hoses that would promptly put the blaze out. While a flame could be doused, other incidents proved unavoidable. Over the past century, a few unfortunate decisions have left boats wrecked in the rocky shallows. 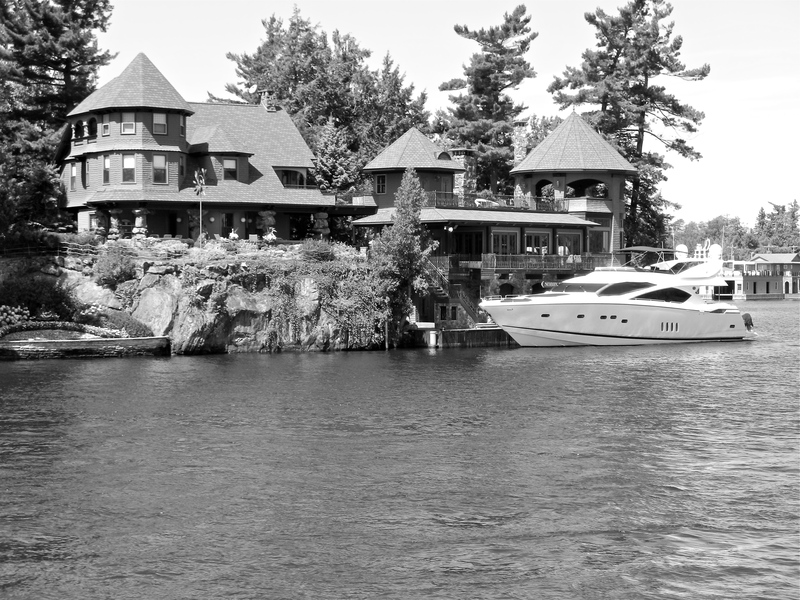 the Boldt family yacht house on Wellesley Island, New York. 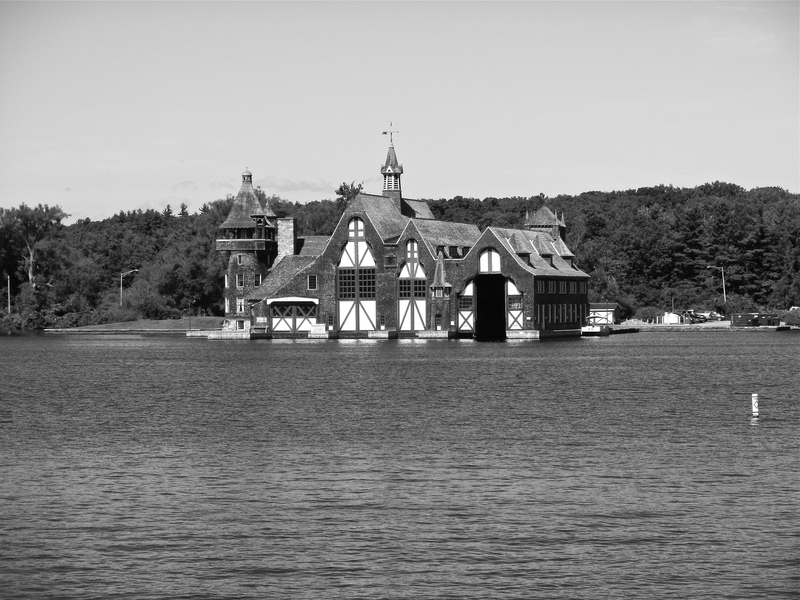 The most famous boathouse belonged to George Boldt. 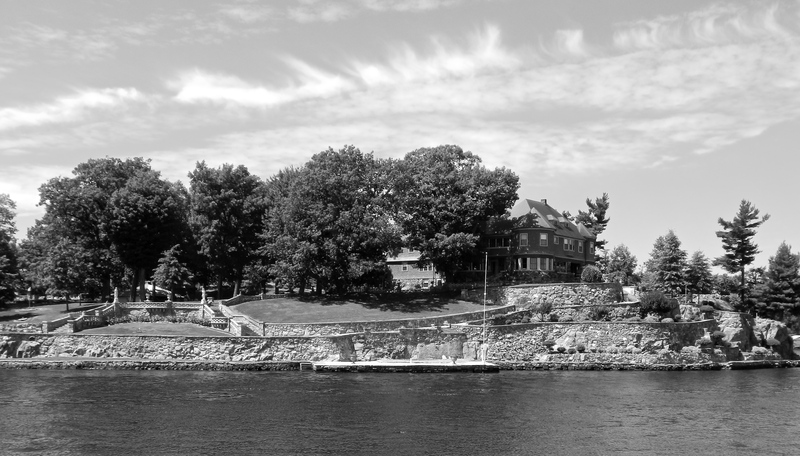 Located across the river from Boldt Castle on Heart Island was the Boldt family yacht house on Wellesley Island. One of the largest in the country, the yacht house is the first boathouse to be recognized as a national historic landmark. Inside, 128-foot boat slips housed the Boldt’s yachts. There were also several rooms for the boat crews to live in the structure. Large home with even larger boathouse. Alexandria Bay is an incredible area loaded with unforgettable beauty, clear, blue waters reminiscent of Florida, and spectacular architecture that often looks as though it was plucked from an old fashioned Christmas scene. 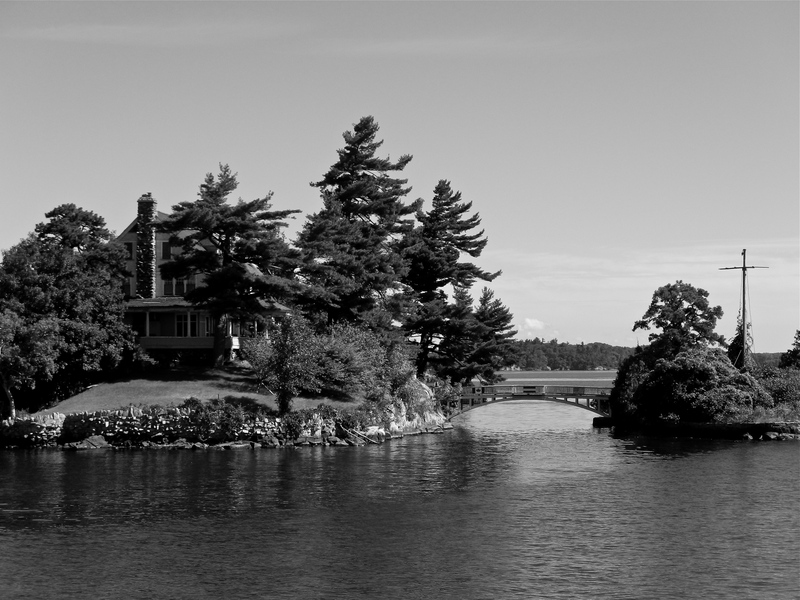 If ever in upstate New York or southern Ontario, Alexandria Bay and the Thousand Islands are a must see. Whether you prefer a hotel or a tent, to be served a fish or catch one, there is something for everyone. Considering the great wealth that still dwells within the historic region, you may run in to some notable people of our generation while admiring the footprints of those from the past. Folino, Thomas F. Alexandria Bay. Charleston, SC: Arcadia, 2004. Print. “History : Official Website: Alexandria Bay Chamber of Commerce, Thousand Islands NY.” Official Website Alexandria Bay Chamber of Commerce Thousand Islands NY RSS. N.p., n.d. Web. 01 Sept. 2014. 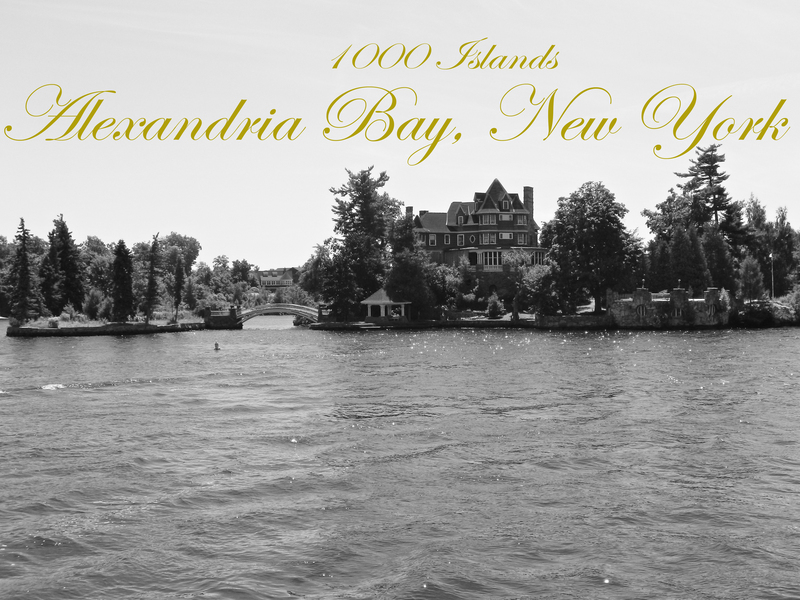 “Home.” Official Boldt Castle Website Alexandria Bay NY in the Heart of the 1000 Islands RSS. N.p., n.d. Web. 20 Aug. 2014.